Happy hump day, dear readers! For today's blog post, I have a new-to-me brand I was introduced to at the UberChic Beauty launch party. I picked up a beautiful thermal shade by Ah Ha! Nail Lacquer, and rather than wait until I got home, I swatched it while I was in Colorado. This is Purple to Blue Thermal Shimmer. 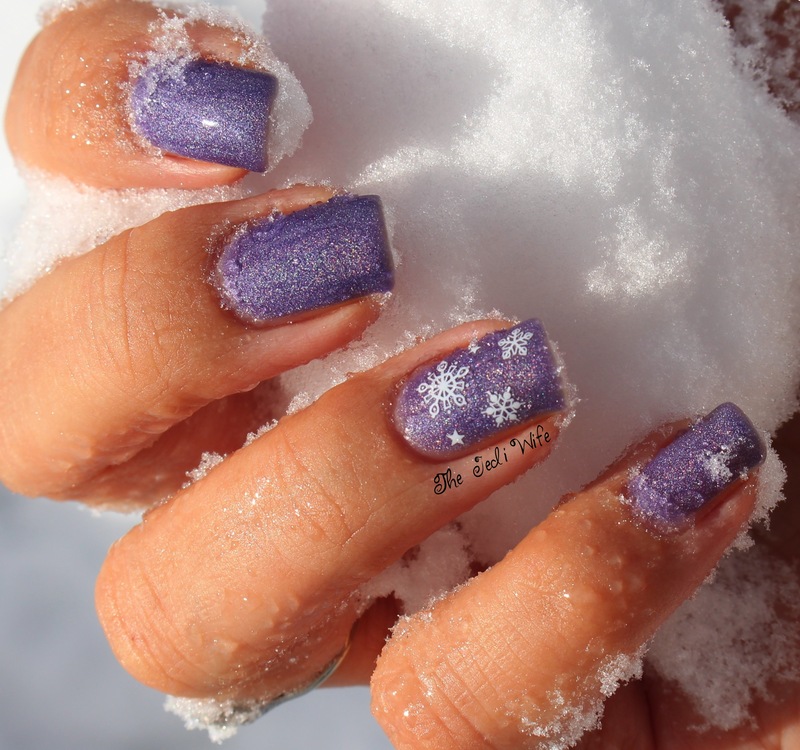 Because I was surrounded by snow, I naturally had to include snowflakes on my accent nail! The warm state is a beautiful light blue and the cold state is purple. You guys know I hate the cold, right? I am so dedicated to this blog that I shoved my hands in the snow to get cold temperature state and for photos. This is a gorgeous polish, but it is on the sheer side. I had to use four coats for opacity, and if my nails were longer, I probably would have needed another one. As pretty as this thermal is, I doubt I'll wear it again with it needing so many coats. I just don't have the time or patience for polish that takes several coats, and three is my limit. The formula was really nice, so if you don't mind using several coats or starting off with a base, this shade is available for purchase here. Until next time, have a wonderful day! You are a better blogger than I, I would not put my hands in snow for anyone. :p This is a gorgeous swatch, shame to hear the formula is so thin. Gorgeous thermal holo! I love the picture with snow! Argh! It is snowing here now, but the good news is that I just heard my first thunder of the year. Yay thundersnow! This is so pretty! It's a shame that it takes so many coats, though. I wouldn't have been as patient! Very pretty, but lots of other blue to purple thermals that don't need 4 coats. 3 is my limit! It's pretty, but I don't want to work that hard on applying polish. The color shift is really beautiful and I love the snowflake accents. <3 I don't like being cold either so I applaud you for being willing to pick up that snow! The shift is gorgeous! But four coats like you said is just too much. You're awesome I don't even like sticking my hand in snow when we have it in Toronto! Lol. Happy 6th Birthday, Glisten & Glow!